herb to heal a problem of the present. Mahabharata to solve your everyday problems. When I received the book, I looked at the lovely cover and the little message inked on the first page of the book. I personally feel that this little gesture on the author’s part was really touching. The title says meditation while your eyes are open. It is quite true. The moment you open the book and look through the index, you will be pleasantly surprised to see little chapters are bundled together to form this book. The chapter titles in themselves are so interesting. I have read two books from this author already and I enjoy how he gives us examples from the ancient texts of the Ramayana and Mahabharata. The author has truly put his teaching and wisdom in the book. The word meditating means “focus one's mind for a period of time, in silence or with the aid of chanting, for religious or spiritual purposes or as a method of relaxation.” One wonders that how can that be done with the eyes open. When you read the book you will know exactly how it is done. We face lots of challenges in our life and we are left with question marks. It is said that one can solve the problems of other person’s life but when it comes to their own life, it becomes tricky as well as difficult. But fear not because when you get your hands on this book, it will act as your guide to difficult times. The words which you read in each chapter will make sense with the situations and challenges you face. The writer has an inspirational writing style. The way he puts up the pieces of his work together is very reader friendly and easy to understand. The most useful and handy part of the book is that whenever you read the whole chapter, you will know the gist of it when you read the summary at the end. The summary makes it easy to interpret the whole chapter. It delves into all the topics of life, right from relationships, workplace, talent, decisions, transformation, envy and a lot of other spheres. All of it cannot really be summed up in one line which you will know when you read this book. I felt really relieved after leafing through every page and felt like a burden was lifted off one by one. I recommend that everybody who is having crisis in their life or facing some kind of sadness should definitely read this book. And otherwise as well you should give it a chance, you will not be disappointed. Once again I got a chance to read mythology because of Blogadda and the author Shubha Vilas. To be honest he is the only person I have read till date for mythology, otherwise during childhood I had sufficed with the tele serials featuring mythology. Not my favourite genre but I would say I am beginning to develop a taste for it. 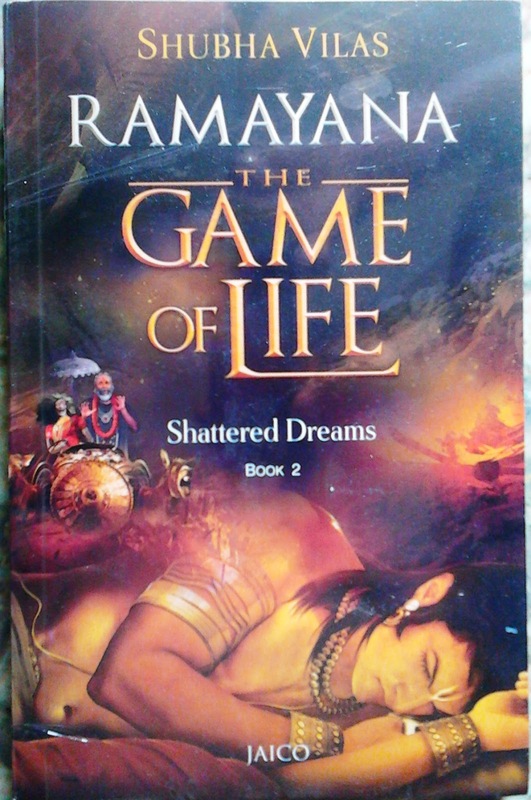 Thanks to blogadda I had read the previous novel Ramayana - The Game of Life: The Shattered Dreams by Shubha Vilas. And after reading that I read the first part, well I was just making sure that I go through the whole thing. So when the opportunity for reviewing the third book in the series came up I was very excited. For the people who haven’t gone through the first two books the author has been thoughtful and provided the summary for the respective books before the actual starting of the book. The book starts with Ram, Sita and Lakshmana, well into their exile at the Dandakaranya forest. They proceed inside the forest with unfolding of mesmerizing history about the forest told by different sages. They move to Panchavati in tranquil and peace. They had decided to spend their last year of exile in the beautiful forest of Panchvati. But as fate has it, in the last year of their exile, they encounter the demon Surpanakha. Surpanakha plays a very vital role in the Ramayana. She is the reason and the pivot to the impending war and the destruction of the demon king Ravana. The book goes on about till the point where Sita is abducted by Ravana. As I write the summarized plot I see that this is not a spoiler for the book because the true essence of the book is enveloped with the enriching footnotes by the author. As promised in the summary it was true to its word simplifying the epic tale of Ramayana and merging it with life lessons beautifully. It has been well researched as like the other two past series. The footnotes as always are the highlight of the book and the short tales in every chapter are cherry on the top. The title is true to the books content. And the division of the chapters seem smooth for reading without making a break in the scenes. After reading this book I would say I have learned many things about life and in general along with Ramayana. Its worth a read like the previous books and I would rate it three out of five stars. Shubha Vilas, an otherworldly seeker and a motivational speaker, holds a degree in Engineering and law with specialization in Patent Law. His leadership classes are well known with top-level administration in corporate houses. He likewise offers people some assistance with applying so as to deal with present day life circumstances the teachings of the Bhagavad Gita, Ramayana and other dharma customs. The title holds the essence of the whole story and very accurately presented. The book starts on a very light note and for first couple of pages you may feel like It is going to be the same usual romantic story. But once the plot is set and the characters have been introduced to you is when the fun starts. A renowned author and banker in National Bank by profession Aditya who has all the good looks and charms to impress his readers as well as the others coming in contact with him. He is called as a speaker back to his management institute, Indian Institute Of Management -Bengaluru where he gets in an argument with a student Shreya who is the second lead of the book. Shreya is enthusiastic, intelligent, voracious reader and next in line for Chairman’s gold medal in her institute. Their argument leads them to contact each other later on and then starts a story which ends up changing Aditya’s life. There is a steady build up in the story. The plot is weaved with utmost care. The characters are introduced quite well. The history and present being narrated with the introduction of the character gives you quite a nice knowledge about him/her. The main leads Aditya and Shreya grab the spotlight in the story and at times it shifts to Aditya’s wife Maya. Maya is currently teaching twelfth graders in DAIS and also taking up social initiatives there. Sanjay who is Aditya’s friend, Diana a co-worker come competitor of Aditya’s, Sunaina who is best-friend of Shreya are the other prominent characters who are present throughout. Some pages later we find Aditya spots Shreya at his book event organised by EasyLib in Bengaluru where she informs that she had let go her first day of campus placements to be in his event. The game starts and Aditya is impressed. The rendezvous starts once she gets placed at National Bank because of Aditya. As the summary says from that point starts the “combustible cocktail of love, betrayal and redemption”. The adulterous relationship of Aditya with Shreya rains havoc on his married life. Shreya still wants Aditya in her life and her first book to be the best. At the end it is very aptly defined that the one book written by Shreya is a bestseller and the only one she writes. At some points one may feel there is an overdose of brand names, place names, writer names and celebrity names. But all in all it has that conviction which will make you read it till the end. The thriller as it is opens up at the ending. Grab a copy as soon as possible. And do read to find out Does Maya give him a second chance after the revelation? Does Aditya’s life change for good or for bad? Does betrayal costs everyone and everything in Aditya’s life? Thank you Blogadda for another beautiful book and that too an author signed copy.